This popular eyepiece adapter allows 2" eyepieces, diagonals, and other accessories to be used in 1.25" focusers, diagonals and barlows. Precision machined from black anodized aluminum, this premium adapter includes a brass compression ring that restrains the eyepiece and prevents marring of the eyepiece barrel by the metal set-screw. The lower barrel is threaded to accept standard 1.25" filters. Total height = 2.35" (59.8mm). Height of upper 2" barrel = 1.53" (38.8mm). Height of lower 1.25" barrel = 0.8" (21mm). Weight = 3.1oz. Please note that the use of extension/conversion tubes such as this item requires additional in-focus travel. If your eyepiece is fully seated in the 2" upper barrel, then you will require 1.53" of additional in-focus travel. If your eyepiece does not fully seat in the barrel and extends out, then you will require additional in-focus travel by the amount the eyepiece extends out. As in the case of barlows, focal reducers, diagonals, and other accessories, your telescope may or may not be able to accommodate this additional travel requirement, so you may not be able to reach focus with all eyepieces and configurations. That is technically a limitation of the mechanical design of the telescope and not a shortcoming of the product itself. Also, it is possible that your view through some 2" eyepieces might be vignetted when used with this adapter because of the smaller 1.25" barrel in the light path. This will depend on your telescope and eyepiece combination and cannot be predicted in advance. 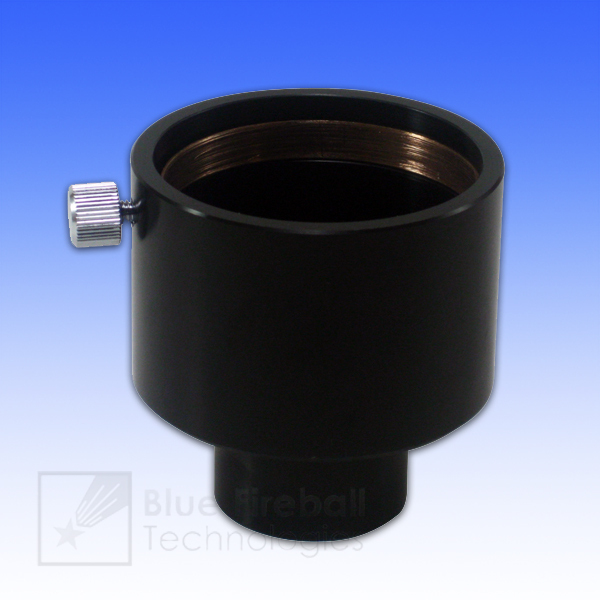 However, many customers have successfully used this adapter with many 2" eyepieces, especially in the Meade ETX line of telescopes. 4.8 (Based on 20 Reviews) 100% of reviewers recommended this product. I got this to use a 2” barreled 18mm Explore Scientific 82 afov eyepiece with my Vixen 130 Newtonian which only has a 1.25” eyepiece barrel. It works great! I use this to use my 2" eyepieces with a Coronado SolarmaxII scope that has a 1 1/4" diagonal. Works well and it is well made, Of course you wont get the full 2" eyepiece experience but you will get the comfort of using your favorite eyepieces. Yes, now I can also use my wide field 2 inch optics on my scope for more versatility. Very well made and finely finished black anodize. Securely holds your pricy 2" optics and allows their use in scopes with 1.25" ports. Works well. Review by Just a customer of Wyoming. 5.0 Great way to swap out 1 1/4 ep for a 2"
Allows you to use 2" ep's without a 2" diagonal. Review by Chuck of Brook Park, Ohio. Bought this so I could use some of my 2 inch filters on a 1-1/4" eyepiece holder. I screw the 2 inch filter onto a 1-1/4" to 2 inch eyepiece adapter holder and insert it in this adaper with a 1-1/4" eyepiece. You could also use 1-1/4" filters with 2 inch eyepieces with this adapter on a telescope that doesn't allow the use of 2 inch eyepieces. Review by Wild Bill of San Diego, CA. The 2 inch ID of the adaptor allowed the Barlow to fit perfectly inside, on plane and optical axis, and it was done! Spectacular views, with no edge-distortion or crunching! Review by Duce of Tampa, FL. Great fit on all of my lenses and filters. Adapters are essential to utilize all the variations of products possessed by anyone who has been involved in visual astronomy for more than a decade, or so. This item does its job. Review by Pete of Morristown, NJ. Worked extremely well to mate a DSLR camera to ETX-90 telescope. Set up to observe the transit of Venus, no problems focusing the camera from near to infinity. Review by Astro Bug Richard of Sunnyvale,CA. I finaly found a way to use some of my two inch accessaries with a one and a quarter inch focuser. Like a two inch diagnal and some two inch eye pieces. Most adapters reduce down in size. I could not find this combination any were until I found the Blue Fireball adapter from Agena Astro Products. I think it was a great find and is made very well. Thanks for providing me with more options. Review by futari of Barcelona Spain. Review by Seppo Kouva of Trollhttan, Sweden. Review by Woody of Georgetown, TX. I originally purchased this to use in an ETX-125 focuser with 2" eyepieces but it works well in my other 1.25" focusers too. The brass compression ring is also a very nice touch. Review by Nightly of Delaware. This adapter has made a great scope even more enjoyable. With 2 inch EPs the ETX 125 can really shine. Solid construction and ease of use combine with a great price to this adapter an excellent value. If you have 2 inch EPs and an ETX give it a try. Review by prc1950 of Iowa. Allows use of some 2" eyepieces for the Mead ETX series and probably others, although I have no experiance other than what I have tried. Review by Solar observer of Seattle, Washington. I use this device to bridge between a 2" H-Alpha solar filter assembly and a 1.25" telescope focuser. The only problem I have with this device is that the knurled screw that it uses to hold the 2" lens in place is a bit short and it is difficult to tighten and loosen it if you have big fingers, like me. If that were a little longer, I would have no complaints whatsoever.